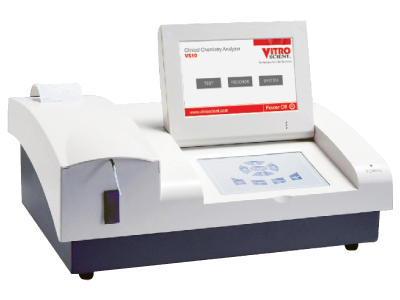 VS – 10 a compact semi-automated clinical chemistry analyser. VS – 10 has been designed to provide the best solution for medium and small sized laboratories. The combination of the following features in one equipment has made our VS 10 an indispensable part of the clinical laboratory despite of its size. End point, kinetics, two points and absorbance. Reagent blank and sample blank. Memory for reagent blank and standard value. Power on self-check and malfunction alarm. Lamp automatic protection, user-define setting time. Real time absorbance curve and temperature display. Open system for any reagent. Multiform reports by project, patient or history data.